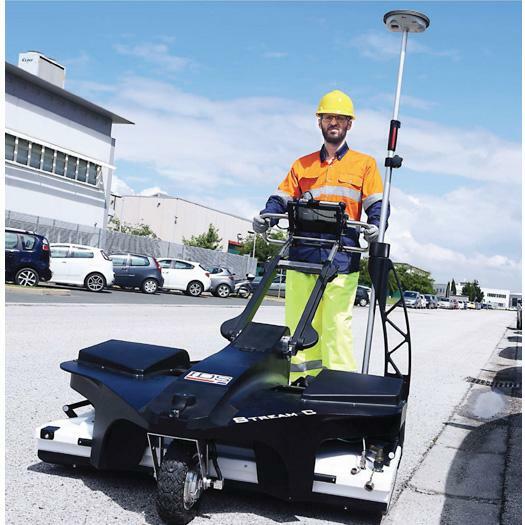 The RIS Hi-MOD represents the latest generation technology in highly modular Multi frequency array based GPR for providing highly accurate mapping of utilities. The RIS Hi-MOD utilizes up to 4 Dual frequency antennas (operating at 200 MHz and 600 MHz) antennas (i.e. 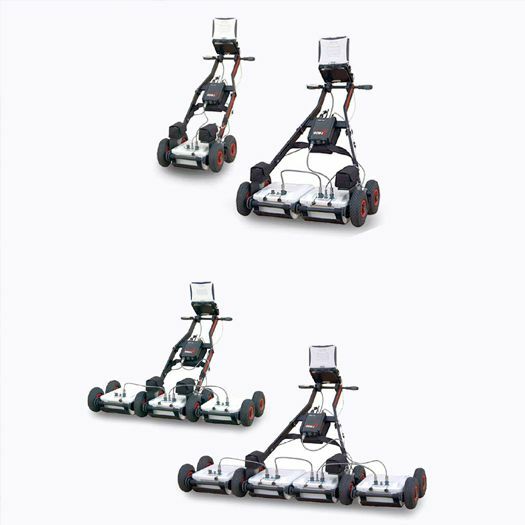 up to 8 channels) and is based on a cart system that is 2.0m wide, providing max walking speed up to 10km/hr. The RIS MF is unique in providing the field procedure of making both longitudinal and transversal scans in one go. 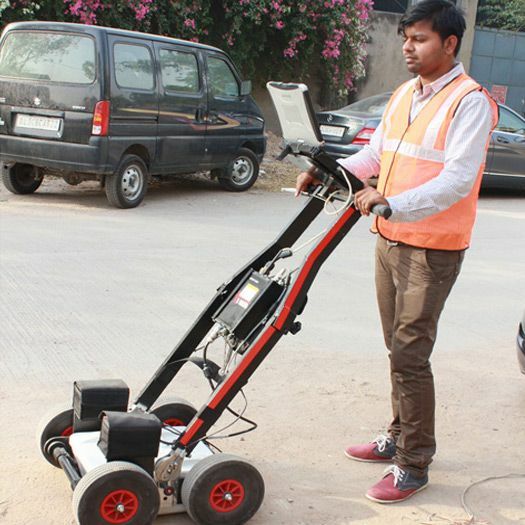 The system is based on a central high powered processing system controller connected to multiple antennas, connected in a chain architecture to carry out high resolution capture, collation and processing of underground utility data over large areas which can be exported to CAD for mapping in 2D/3D. Chain Architecture :Antennas are added to the system in a "chain" connection in"plug and play" mode. Robust : Robust mechanical structure for intensive use. The trolley has been designed for both asphalt and rough terrain. Provided with tough book laptop. Automatic target identification for high productivity. Database for rational storage of large volume of data. 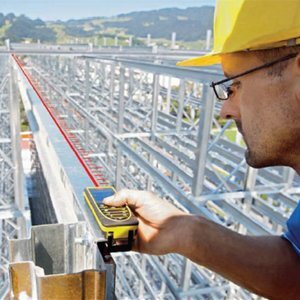 Deep and shallow antennas in one compact box: Two antennas in the same box, with the option of choosing 200 MHz & 600MHz or 400 MHz & 900MHz, help the operator to locate pipes and cables by providing the proper frequency for a specific search parameter. It provides a real-time display of deep and shallow antennas on the same screen. 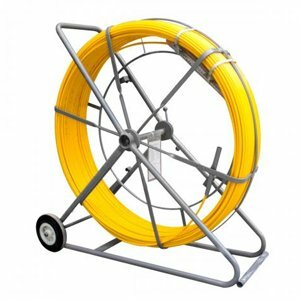 Modular: Antenna boxes can be quickly added in “chain connection” while in the field (no tools required) with up to 8 in operation simultaneously. As a result, the system is able to work in any available space. 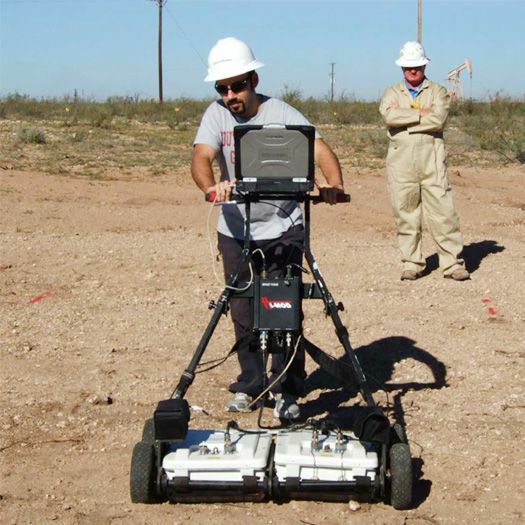 3D Radar Tomography: Multi-frequency data fusion and a consolidated procedure to collect the data enable accurate 3D images of the subsurface to be achieved, helping the operator to distinguish individual anomalies and buried targets. 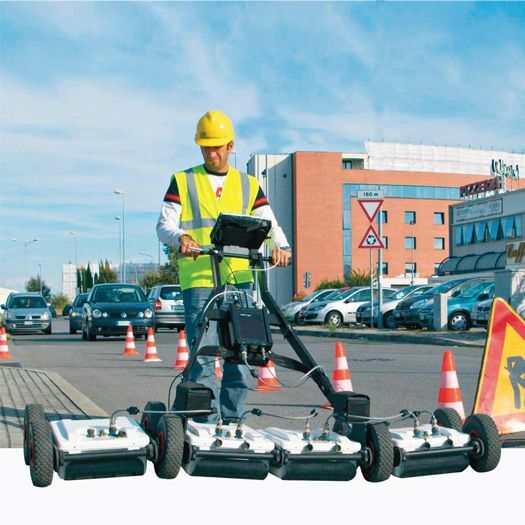 Professional utility mapping capability: The result can be exported in several formats including GIS and CAD (AutoCAD or MicroStation) for a professional survey. Flexible: Powered by the IDS Multi-channel Control unit, the system can be used to drive every IDS antenna. K2 FASTWAVE Software is the acquisition software designed to work with the IDS DAD FastWave control unit (single or multi-channel) and is included in the DAD package. 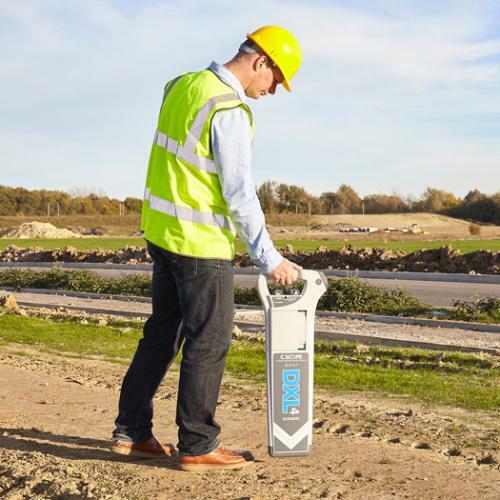 The K2 FastWave is able to support the acquisition of up to 8 antennas connected in chain and is able to show two radargrams simultaneously on the screen in real time during the acquisition phase. The software comes with comprehensive tools to customize the acquisition parameters and calibrate the signal of every acquisition channel. From the initial interface the operator can estimate the propagation velocity as well as modify many other parameters.K2 FastWave is also able to continuously monitor the status of the system, providing an alarm for every possible malfunction that can happen in the field.K2 FastWave also has a dedicated tool to help the user collect data in grid mode in order to achieve the best results from the survey, mixing longitudinal and transversal scans in the post processing. 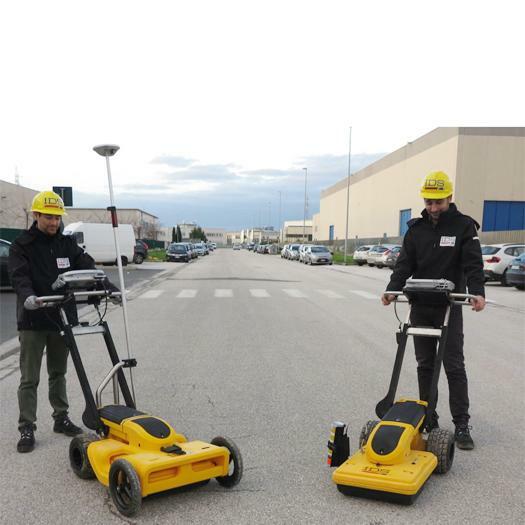 The system can be connected to GPS and is able to record the path in real time and mark anomalies: the data is stored in a dedicated folder and is easy to access in the future post processing phase. GRED is an easy to use post processing software able to post process the data acquired with the IDS K2 FastWave. 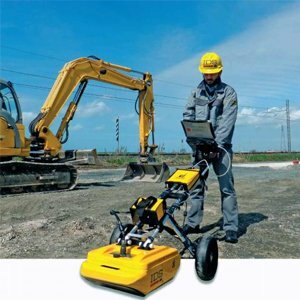 The software offers general tools and features and can be used for several applications from geology and archaeology to underground utility detection. This software is equipped with basic features and is recommended for users that have to analyze data in the office and want to maximize their capability of interpretation. With this software the user will be able to process in 2D the radargram acquired in the field. GRED 3D is an advanced post processing software for 3D and tomographic rendering of the acquired data. 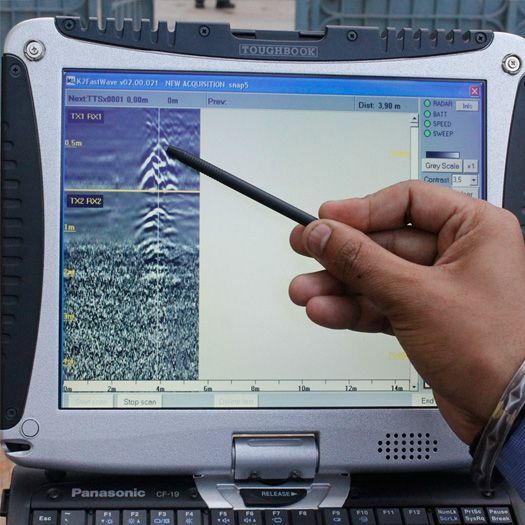 The software is able to present a 3-dimensional view of the subsurface, with a complete set of options for navigate within it, cutting it and marking anomalies. The software is also able to export 2D plan-view slices of the subsurface from which the operator can best interpret anomalies and pipes. 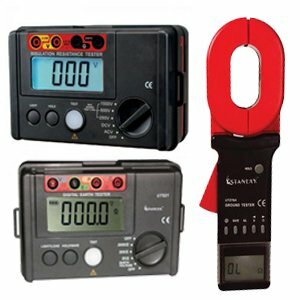 The pipes and cables detected can be marked with a dedicated tool where the operator can specify a color for each pipe, the depth of it and an estimate of the dimensions. The marked pipes can then be visible in the 3D view, the 2D tomography slice and the traditional radargram. The software is also able to show multiple radargrams simultaneously to enhance the capability of the interpretation. GRED 3D CAD for Windows XP is an industrial software dedicated to processing RIS data and generating cartographic output. The environment has been designed to provide highly interactive and efficient management of the large quantity of data acquired by the RIS Acquisition Unit. The 2 monitor configuration permits you to view radargrams as multiple sections (standard representation) together with the tomographic view. Results of the data analysis can be transferred to CAD either using an interactive link or at the end of the work session. In the latter case, GEO MAP automatically generates the final cartographic output. The innovative functions allow a reduction in the human factor in the radar data interpretation with a drastic reduction in the data processing time. Representation of irregular acquisitions useful for areas with "holes" inside (e.g. gasoline stations, industrial plants, etc...). All the radar data and analysis results are stored in a relational data base in order to have both a historical archive and to be able to rapidly and efficiently search and select data. Data elaboration, including disturbance and noise reduction filters, gain equalization, tomographic elaboration and estimation of propagation parameters (penetration depth, propagation velocity, attenuation, etc.) is fully automatic, thus avoiding mistakes in inserting processing variables and guaranteeing working times. The GRED 3D UTILITIES module includes all the functions of the previously mentioned modules and in addition contains the automatic target detection management. This procedure is able to detect anomalies with a continuous pattern that can be associated with pipes. Once detected these pipes can be exported in 3D view or directly to CAD/GIS software.